Giving Tuesday Gifts That Keep Giving! Giving Tuesday is an international holiday but also a movement that was initiated in the United States by the 92nd Street YMCA and the United Nations Foundation as a response to counter rampant commercialization and consumerism in the post-Thanksgiving season (Black Friday and Cyber Monday). Gifts are thoughtful and to be appreciated, but sometimes more than what recipients need or even want. Some go to waste and are quickly forgotten while others last longer, like: recipes, perennial flowers, fruit of the month clubs and gift cards. These are gifts that seem to keep giving back to the recipients long after they are given. Give the Gift of Education – Help underprivileged children in the USA improve academic performances and reduce behavioral issues through Phonemic Intelligence – a unique kind of education that can help to enhance intellectual, social and emotional intelligence in just six minutes per day. Your donation will go toward training and support for both students and teachers to successfully use the program throughout the school year. Sponsor children and teachers for just $10 per month! 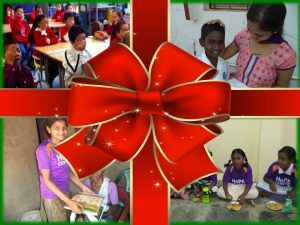 Give the Gift of Destiny – Help underprivileged children in India create new destinies at HoPE Learning Centers where they receive traditional academic tutoring, Dr. Pillai’s brain-changing Phonemic Intelligence Program, brilliant Personal Transformation Program lessons, yoga, nutritious snacks and cultural or career-centered field trips. In addition, each HoPE Learning Center serves needs unique to its surrounding community. Sponsor a child for just $10 per month or an entire HoPE Learning Center of 40 children for $350! Give the Gift of Dignity – Help forgotten and abandoned elders live with dignity. Support an elder for one month with necessities like medicine, food, clothing, and hygienic supplies. Help support this program for $10 per month or sponsor an elderly person for just $40 per month! Give the Gift of Food – Help those living with daily hunger nourish their bodies and minds with nutritious food. $1 provides five meals to those who need it most. Serve 50 nutritious meals for just $10 one time or per month! PS: Have a very happy holiday season!! !